Women generally have a higher risk of developing Chronic Venous Insufficiency or CVI (the clinical term for varicose veins), due to a variety of lifestyle elements such as pregnancy, choice of footwear, and overly tight pants. However, other risk factors (sedentary lifestyle, age, obesity , prolonged sitting or standing, injury, genetic predisposition, smoking, etc.) are known to affect both men and women equally. While our circulatory system is a marvel of nature, tirelessly distributing essential cells and nutrients throughout our body for years without fail, it is not invulnerable to the wear and tear of daily living. 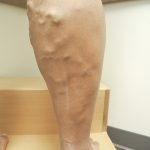 When the blood vessel valves that push blood from the legs to the heart start to break down and cease to function, it can cause blood to pool in the legs. 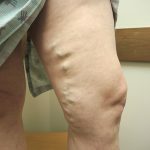 This is the phenomenon behind the unsightly network of purple/blue veins we refer to as varicose veins or CVI. Because CVI is a serious medical condition with potentially devastating health complications, ClosureFast treatment is covered under most health insurance plans. As with any type of medical treatment, there is always the risk of complications, however minimal it may be. Potential side effects may inlcude the following : vessel perforation, skin burn or discoloration, pulmonary embolism, nerve injury, hematoma, and thrombosis. While most cases of CVI can be treated with ClosureFast, only your doctor or specialist can assess the potential risks and benefits and recommend the best treatment for your individual condition.